This is a guest post by Dave McClure, a startup advisor and internet marketing nerd who runs a seed-stage investment program for Founders Fund. So you consider yourself an internet entrepreneur, investor or expert, huh? Chances are you know a lot about what it’s like to be a Western technologist with Western customers, but you know very little about how the other half of the world (also known as Asia) lives and works. If you find yourself reluctantly agreeing with that assessment, perhaps it’s time for you to jump on plane with a bunch of other Bay Area geeks and venture over to the other side of the Pacific Rim. Founders Fund and Web2Asia cordially invite you to join over 25 other techies for an eastward trip we’re calling GeeksOnAPlane (don’t worry, emergency exercises such as this one are not expected mid-flight). Starting on June 7th and lasting for 10 days, our gaggle of geeks will hit up Tokyo, Beijing and Shanghai and learn lots about Asian platforms, markets, and partners along the way. And, of course, we’ll have loads of fun and do some cool touristy stuff as well. Ticket prices vary depending on whether you want to hit up all three cities or just visit one or two. See our event page for full pricing details and the ability to register online today. Airfare gets more expensive after today so make sure to register and book your flights soon. This is a once-in-a-blue-moon opportunity to get a crash course in Asian technology and its associated culture. You’ll not only have a chance to learn about marketing to Asia’s billions of customers. You’ll also meet entrepreneurs in Tokyo, Beijing, and Shanghai to learn how they execute their visions, and how you can translate certain Asian phenomena – such as advanced mobile technology and lucrative casual gaming experiences – into products that appeal to Western audiences. 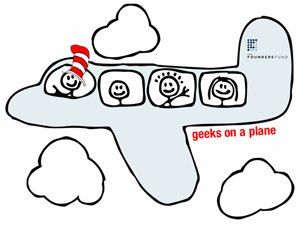 To learn more about the trip, and the various events it entails, visit the GeeksOnAPlane website. We look forward to having you join us!